Creating back to school lunches can be a bit of a chore, but it’s also a favorite chore of mine. I love putting together a well-balanced meal for my girls, and sometimes doing something special to brighten their day at school. Of course, ask me again at the end of the year and I’m pretty sure it won’t be a favorite chore any longer. Today I’m excited to show you this fun new lunch that I’ve thought up and created with palate-pleasing input from my girls. 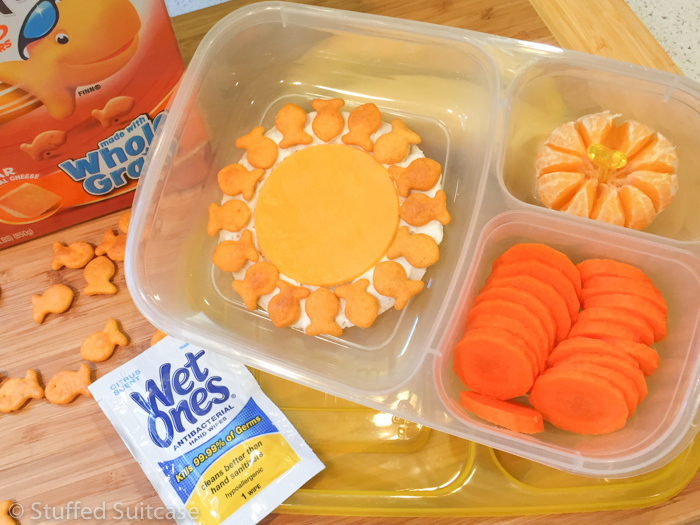 I’ve worked with my sponsors, Pepperidge Farm® Goldfish Crackers and Wet Ones®, to create a sunshine themed school lunch that kids will love, and free printable lunch box notes that will brighten your student’s day! First let’s take a look at how I created this fun and fabulous sunshine lunch! 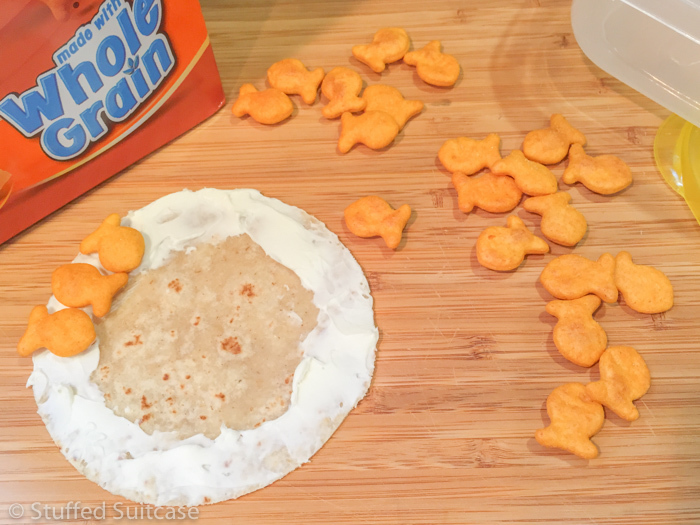 Cut a circle from a tortilla that will fill the space in your kids’ lunch container. I tested plastic cups in the container then used the best fit one as a template to cut around. Apply a layer of cream cheese around the edge of the tortilla. Start placing Goldfish crackers around the edge, alternating their directions. Once you’re finished you can use another smaller size cup to cut a piece of cheddar cheese to place in the center of the tortilla. And there you have it, a sunshine lunch! To complete the full sunshine lunch I added a mandarin / clementine orange, separating the wedges a bit to create a sunburst, and also some orange carrot slices. All these finger foods meant I was sure to grab a single serve Wet Ones to put in the lunch bag so the girls could wipe their hands before eating and remove 99.9% of germs! 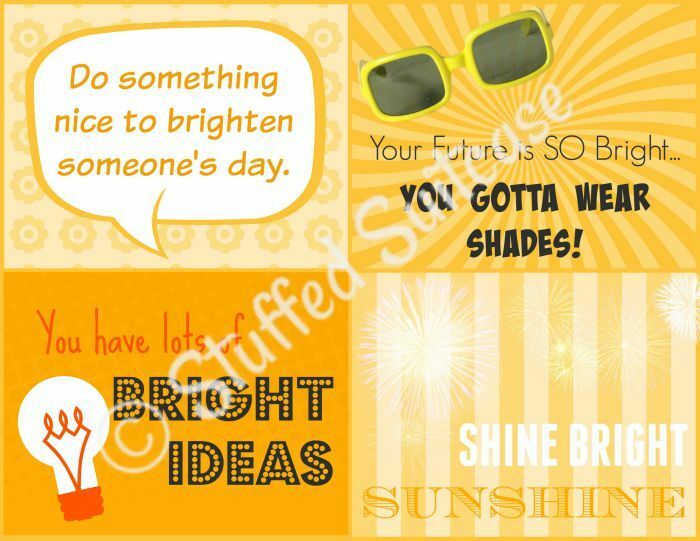 Next up was a final little added bit of sunshine, a printable lunch box note to brighten their day even more! Now you have a fun new idea for school lunches for your kids, and perhaps you’re ready to tackle the “dreaded” school lunch chore. 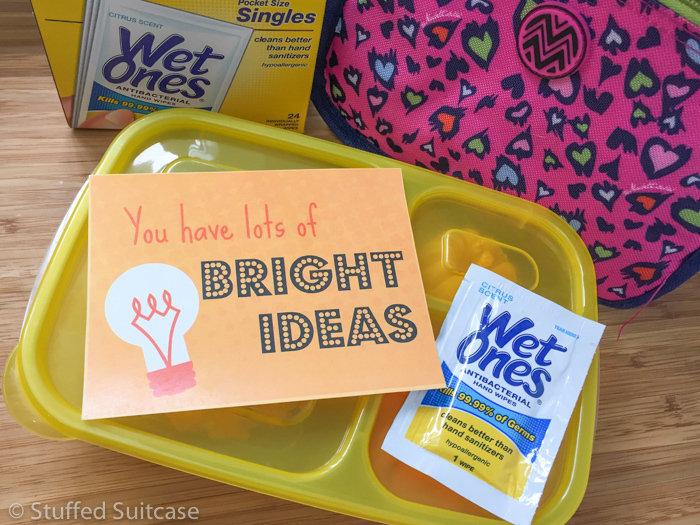 Make sure you grab your own box of Wet Ones singles to make sure your kids have clean hands when they’re ready to dig into their lunches! And you’ve even got the chance to win a year supply of Wet Ones for your home and your child’s classroom! 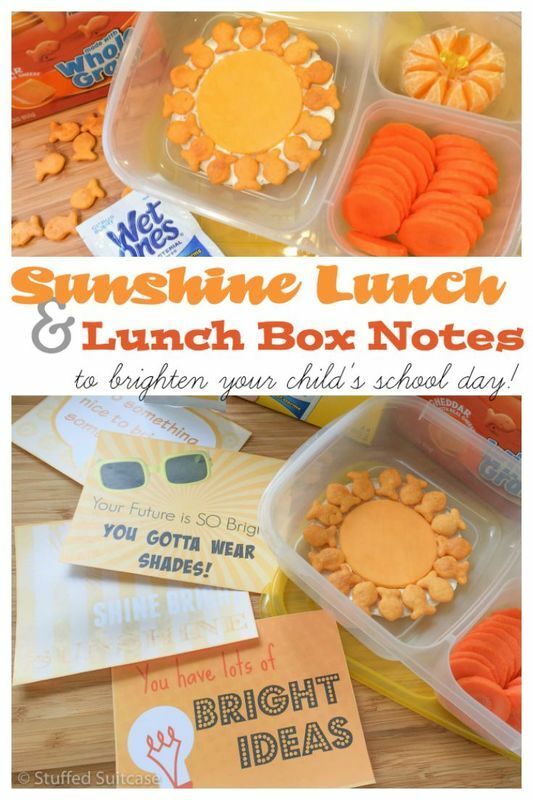 Brighten your kid’s day with this fun sunshine lunch and free printable lunch box note!